Glass printing company Fracture is once again bringing innovation to the digital printing industry. On Monday, the company rolled out a new online marketplace that it hopes will give customers even greater control when choosing prints for gifts, mementos and home decor. With a digital print-to-glass manufacturing process, Fracture’s traditional model of business is to have customers submit personal photos to be printed straight onto a preselected size of glass, replacing the need for picture frames. 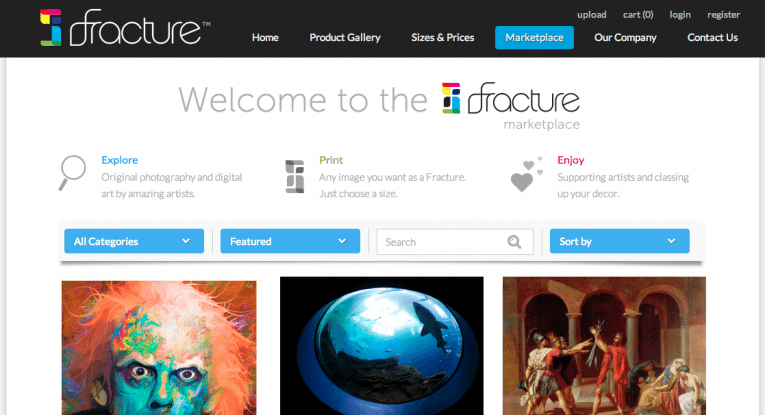 Now with the launch of the marketplace, the company has partnered with a growing number of artists, photographers and other businesses to offer customers pre-designed prints. “We’ve heard a lot from people who want to use our products as gifts, but are afraid that they don’t have any photos worth printing or of high enough quality to print,” said Mike Garrett, the director of marketing for Fracture. Fracture has been developing the marketplace and contacting potential partners since December, Garrett said. The cost of the prints will be the same as the custom prints, between $12 and $125. The marketplace is still in beta testing, but employees think the concept will help the company expand into new markets and make more people comfortable ordering prints. The company would like to see the marketplace evolve into a platform for up-and-coming artists, as well a more engaging community to bring artists closer to art buyers. Artists will retain all ownership and rights for work featured on the marketplace, making a percentage of each sale. At the time of launch, the company has partnered with four photographers and the Bridgeman Art Library. Founded in 2009 by Abhi Lokesh and Alex Theodore, Fracture manufactures each glass print by hand at their facility located at 112 SW 6th St.